I’m always excited for my clients who are expecting babies. But when they’ve struggled with infertility - well, it feels like an especially great honor to be invited to capture their story. 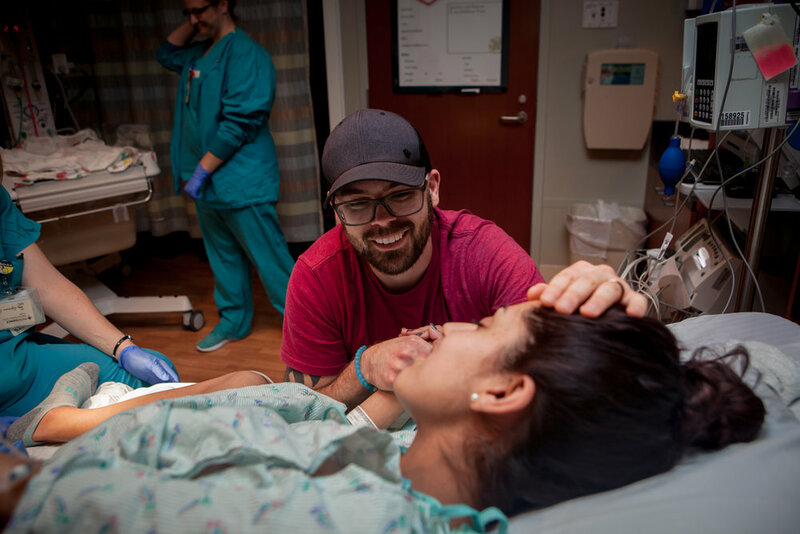 Samantha and Brandon had been hoping and praying and waiting for their little girl and now it was finally time to meet her! Though there was a scheduled C-Section date, Oakley decided she didn’t want to wait that long and we were all surprised when Sam’s water broke. 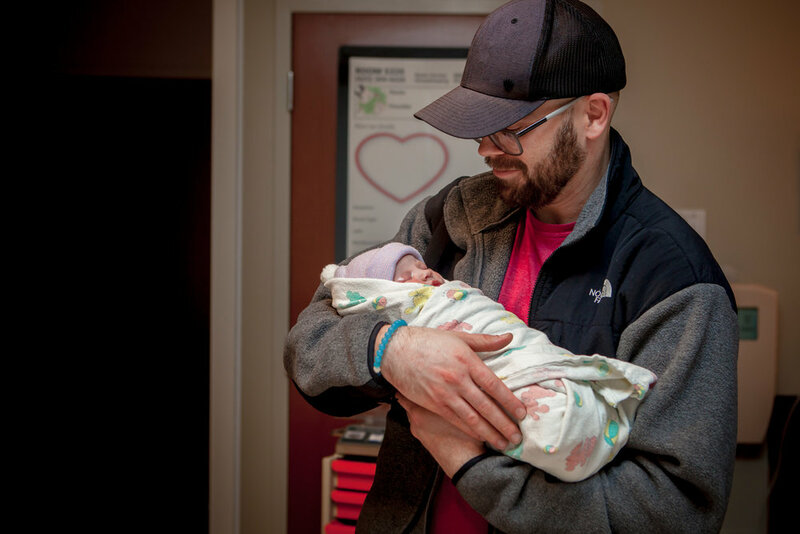 Brandon was called home from work, I was called and we met up at the hospital for the completely surreal experience of waiting to welcome earth’s newest little human. There was time for a phone call with grandma-to-be to share laughter and tears - all the anticipation of the great moments just head. And then it was off to the operating room! This is four generations of women in one image - thanks to modern technology. I may have cried just teensy bit. And look at that little squish face! I just can’t handle it. You’ll notice I took no images of the actual C-section this time around. 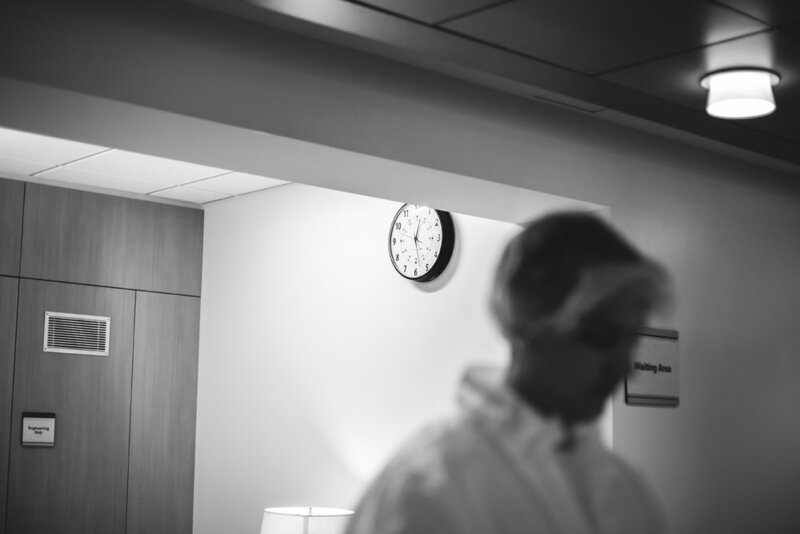 This hospital had a policy of absolutely no photographers in the OR (not for Sam’s lack of trying or advocacy), but I was there to capture every moment before and after and to coach Brandon on what he should photograph in the OR. Clients who book me realize that birth is a STORY and that I am artful storyteller. 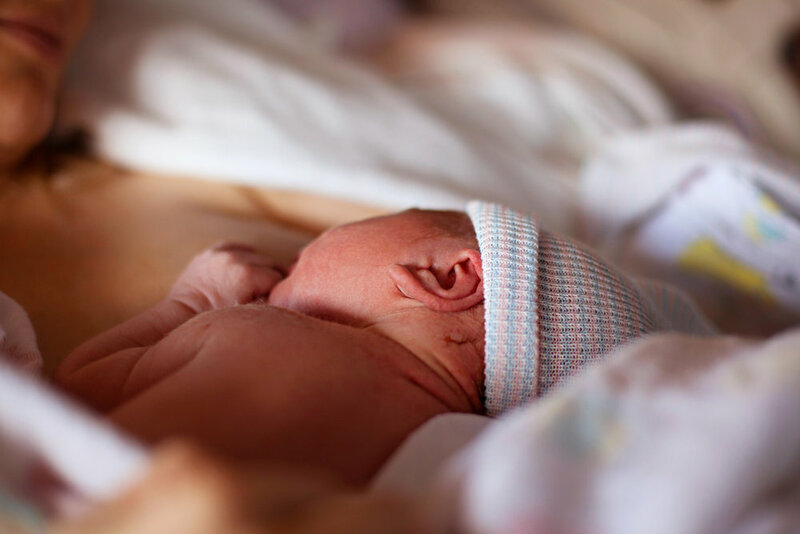 However your child arrives and whatever policies and practices are in place at your hospital, it’s important to remember that birth is so much more than the moment a baby emerges. It’s really the birth of a family. The birth of parents. The hours leading up to welcoming your child and the ones spent getting acquainted. However your birth unfolds - your story is worth documenting. Message me with your questions - check my availability, and let’s have a conversation about capturing this priceless moment for your family. 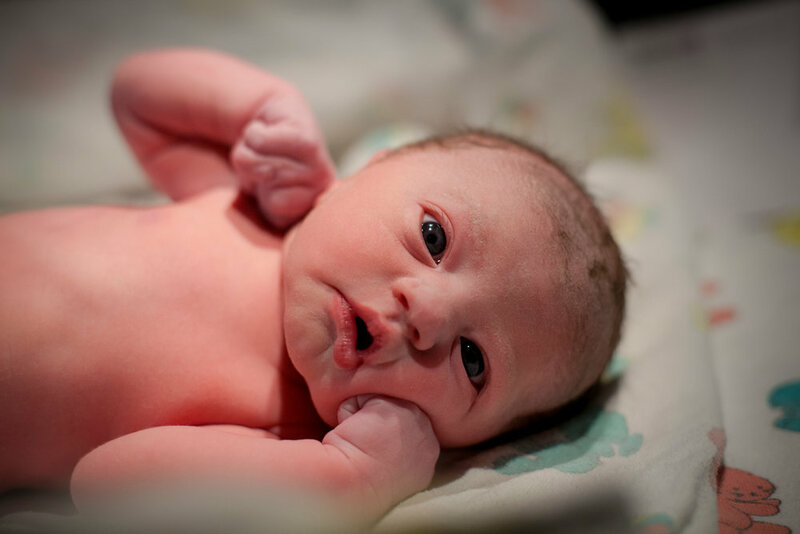 So many things to say about the beautiful home birth of Miss Tessa. Her mama, Katie is a Seattle doula and her papa is a pastor at a local church. I arrived in the early morning hours to a home filled with warmth, the soothing sounds of worship music, and the gentle buzz of excitement as we all prepared to welcome this sweet soul to earth. On the morning Tessa was born I witnessed the confluence of laughter, focus, power and surrender. Birth calls us to deep places within ourselves. It shows us our strength and our vulnerability like nothing else can. 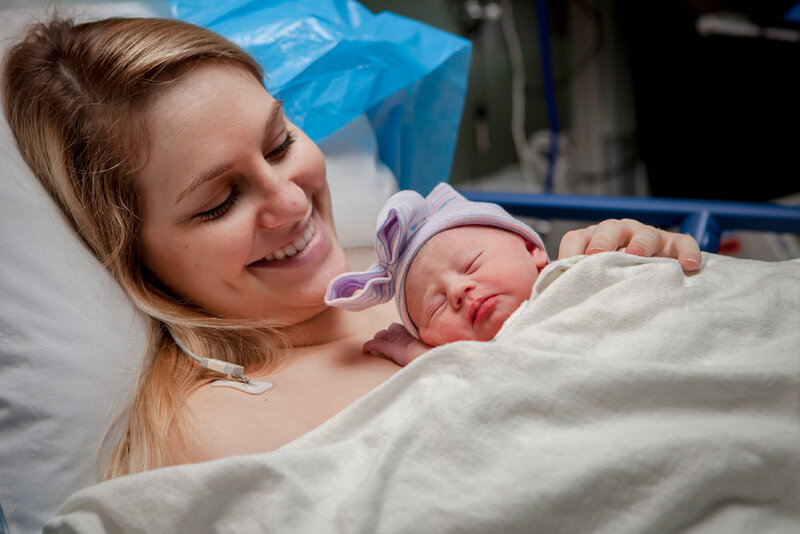 Katie and Tessa labored with the gentle support and confidence of all those present in their home - and they truly experienced a sacred birthing day. Then it was time to push. A mighty endeavor for this mama who was pregnant two whole weeks longer than she had been with her previous children. She fell into a rhythm of push and rest, push and rest. Giving her all and then floating in the support of the water and the loving hands around her. She’s almost there. A hushed reverence descended in the room as Katie and Tessa entered the last leg of their birthing journey together. 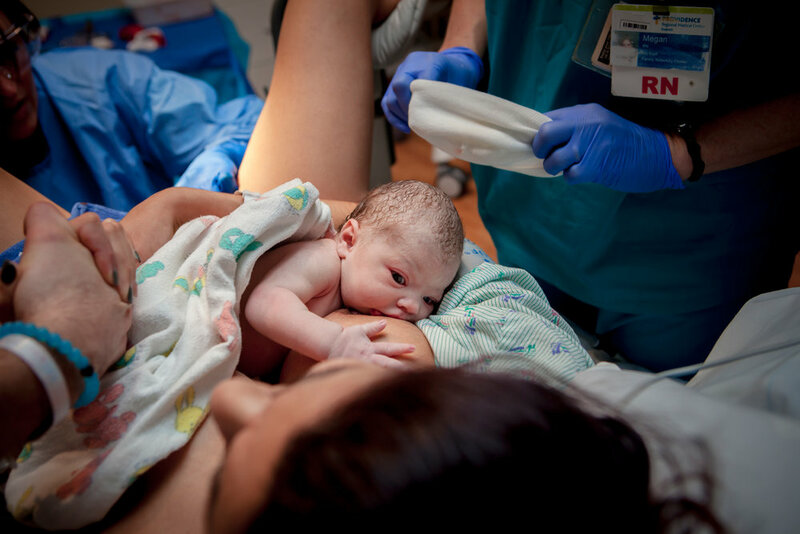 The stillness broken only by the roar of a mother who finally reached down to deliver her long awaited daughter. I love this moment. When you look down in awe, amazed that you made something so perfect - something so miraculous. 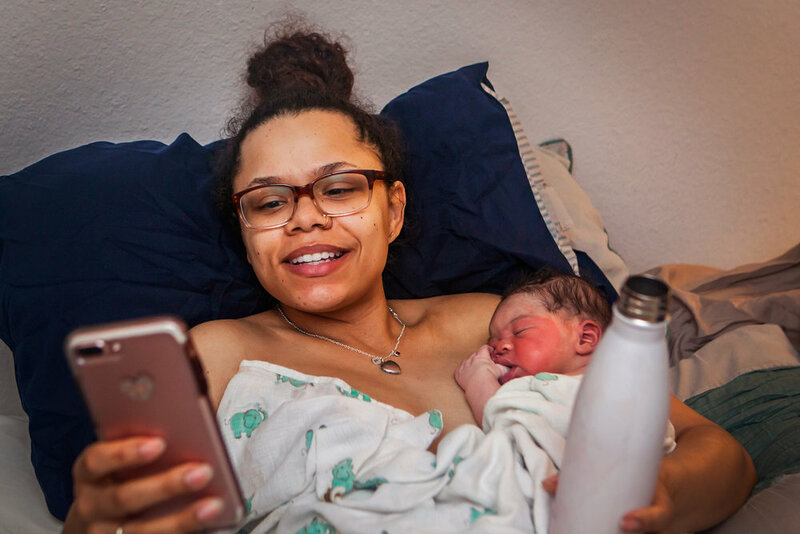 As a birth photographer in Seattle, it brings me such joy to create art that bottles this feeling for a birthing person. YOU did this! YOU are incredible. Congratulations my dear friend - and thank you for allowing me the great honor to be there. Follow Katie @mothervoyage for all things pregnancy, birth, fertility, postpartum and mothering. These were all excellent signs that this birth would be a beautiful experience for everyone involved. After being sent home from Labor and Delivery once with “false labor” and hardly getting any rest, we texted back and forth about the possibility that Chamari was experiencing prodomal labor and I encouraged her to keep resting, and to feel confident that her body was doing exactly what it needed to do to bring her baby here. 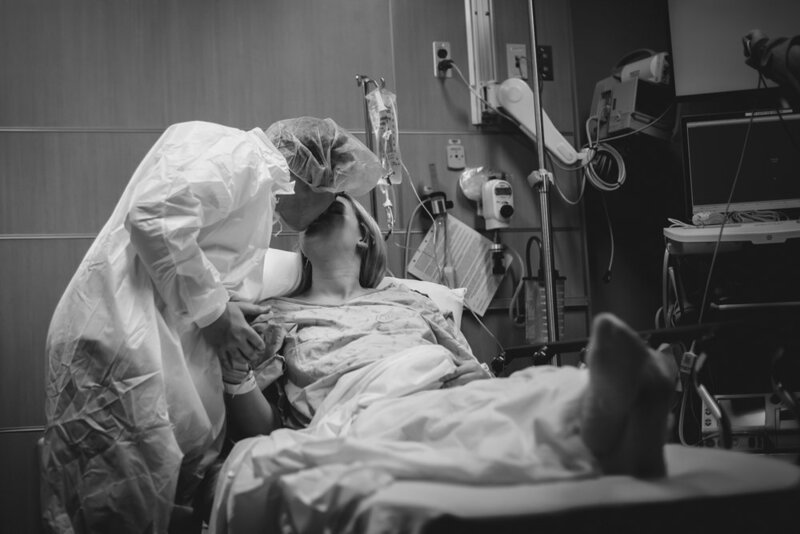 When I arrived to the hospital I found a woman laboring with focus, determination, and grace. It was clear that these contractions were asking the very most of her, and she gave herself to the process completely. I’ll let the photos take it from here. That love and support. Unwavering. He was present with her in the most challenging parts of this process. And in the moments of rest she cracked jokes and we all laughed. Birth is a wondrous unfolding. I could not be more proud of this beautiful family. For loving each other so fiercely, for birthing so fearlessly, and for inviting me along to witness the miracle. If you’re interested in having your birth documented - let’s have a chat in a random coffee shop. It just could be the start of something beautiful. Baby Tessa kept everyone on their toes. Contractions started at 32 weeks gestation — the same time her older sister was born. So into the hospital went Katie for steroid shots, magnesium and a few days of monitoring. No one thought she’d stay in until her induction date. But she did! And the surprises did not end there. Katie labored like an absolute champ. Contractions aren’t known for being pleasant, and pitocin contractions even less so. The sensations of labor are very intense, and every woman needs a solid birth partner. Someone to squeeze your hips, remind you to center your breath, and whisper words of encouragement. 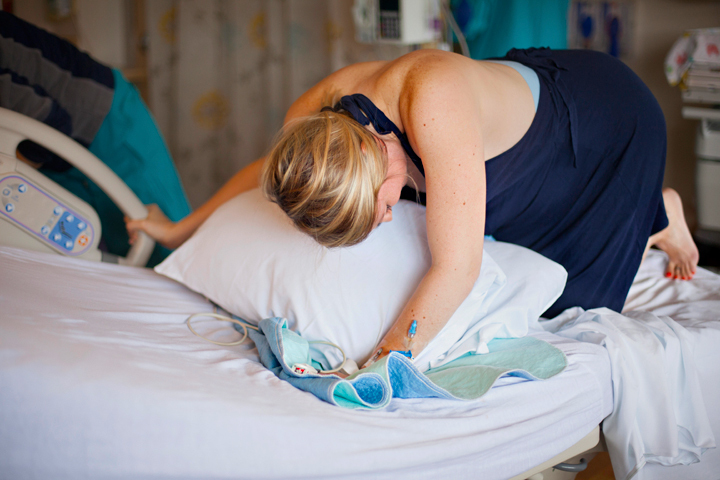 Katie worked hard and knew it was time to get an epidural going to help with pain management. A couple hours of rest (watching video messages from the kids back home) and then it was time to push. After months of waiting, wondering what she will be like, the uncertainty of pregnancy, this baby is only moments away. Katie pushed their baby closer and closer to this world. 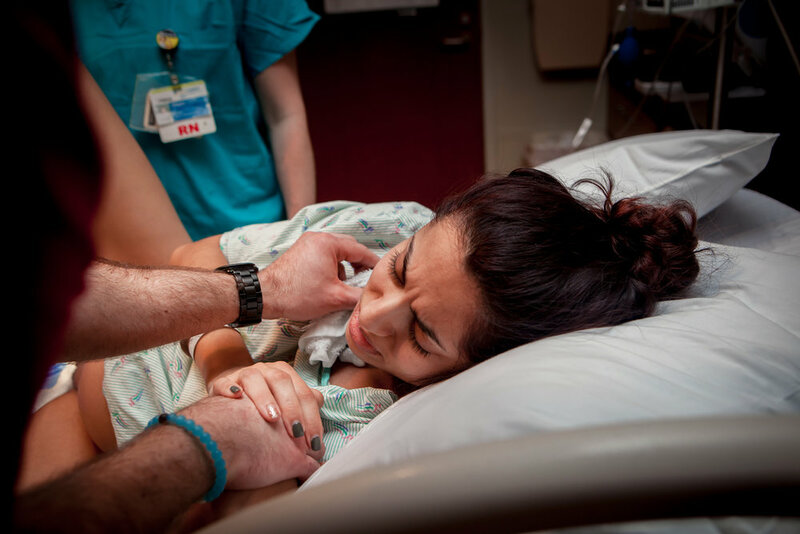 A couple contractions after crowning it became apparent that Tessa was not moving any closer to delivery. The doctor called shoulder dystocia and an entire team flooded the room, prepped to help a baby in distress. Katie cried out in fear. “No!” We all had so many fears and questions racing through our minds. How long will she be stuck? Will she be OK? The medical team was calm, professional, and knowledgeable — everything you need in a moment of crisis. The doctor attempted multiple maneuvers and Cam and I coached Katie to push with everything she had in her. 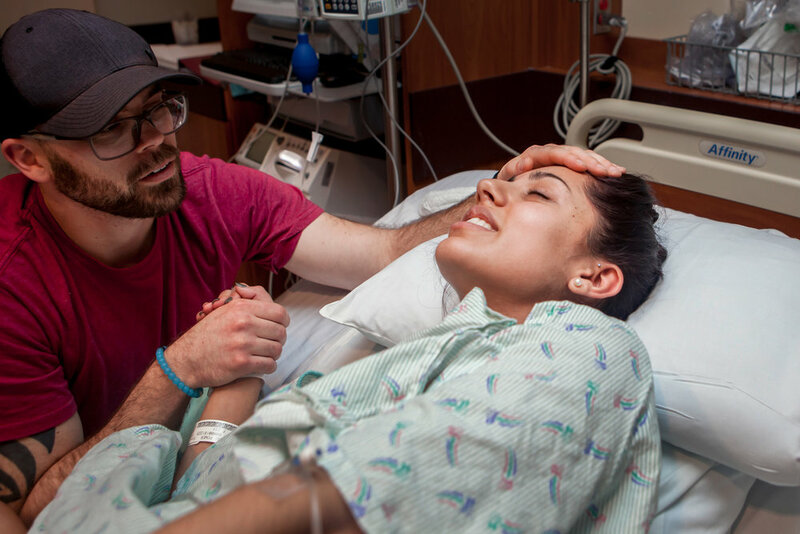 She was so brave and strong and 90 seconds later, their baby was born. Tessa. 10 lb 7.5 oz. There was only time for a moment’s connection. Mama’s hands on that warm, damp head. She was whisked away to the warmer for the NICU team to assess. After this intense delivery, Tessa was a bit limp and there was palpable tension in the room as we waited to hear that reassuring cry. 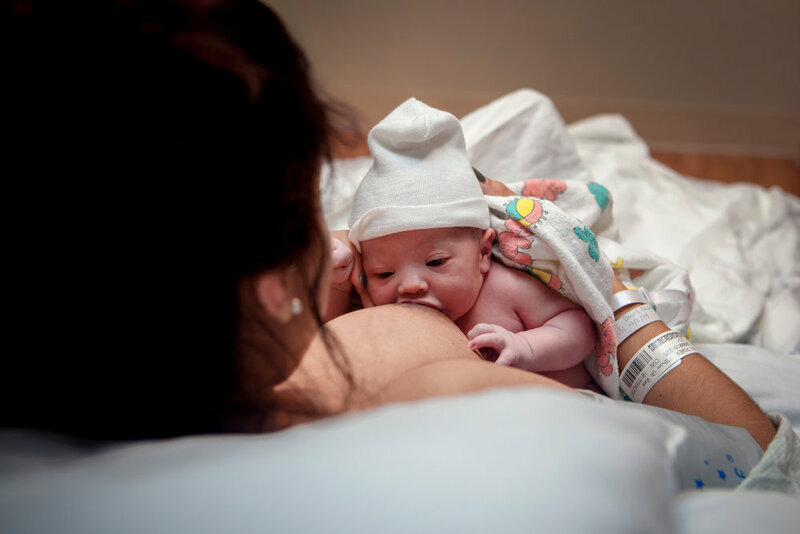 The rate of shoulder dystocia is around 1 in every 100 births, but nearly 10% of all newborns require some form of neonatal resuscitation during that transition from womb to world. 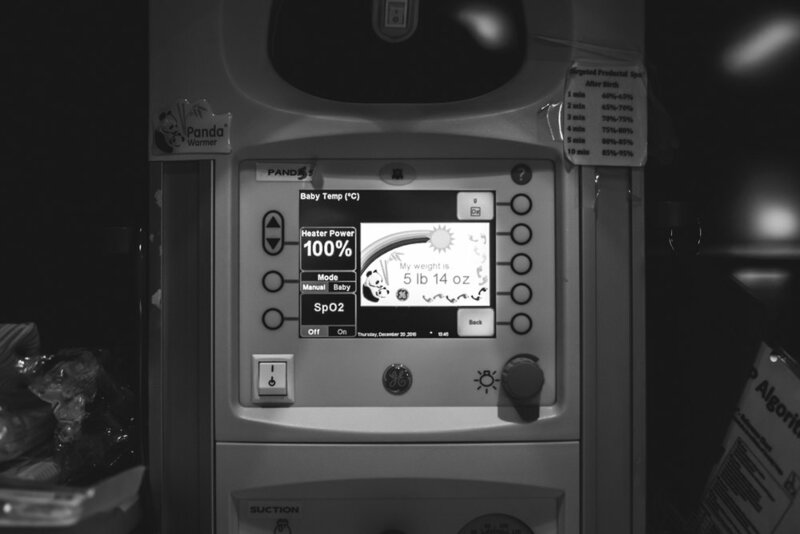 It is not terribly uncommon for a new baby to be administered positive pressure ventilation. Warming beds, drying and stimulating the infant, clearing the airway — these are all steps care providers take to ensure a baby begins to use those lungs to breathe outside of their once watery home. “Good, strong heart rate,” they noted. “This is good news,” I told Katie. She replied, “I heard a pop. 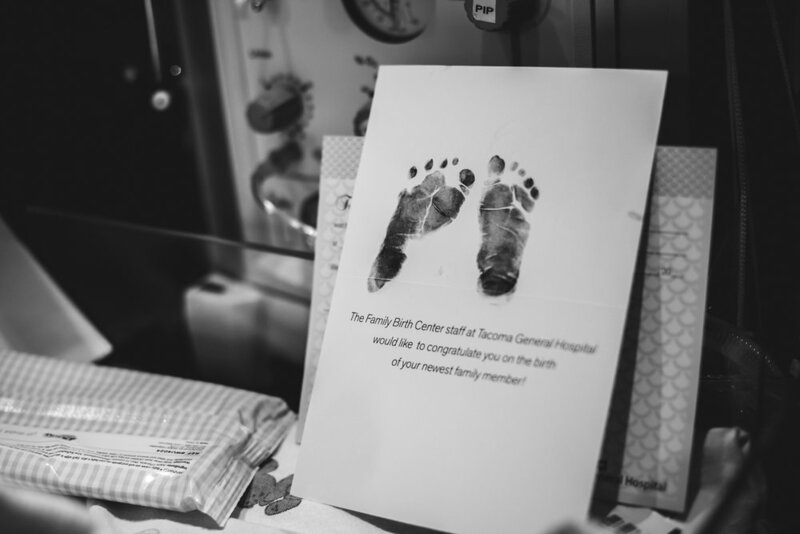 I heard a pop when she was born!” Her nurse and OB calmly reassured Katie that everyone was doing what they could, but for a few agonizing moments, there were no answers. Finally, a cry from across the room. The best sound in the entire world. Our collective relief. But none so relieved as the mother who heard her baby’s first wail — a signal that she was here to stay. When they finally brought that smushy babe over, Katie’s worries melted into tears of relieved joy. Anyone who has birthed a baby knows that nothing compares to the reassuring weight of your child against your chest. They had their first hellos, minutes of snuggling and whispering and admiring this newest miracle. Then it was off to the NICU for Tessa for some X rays and observation. As a side note, did you see the size of that placenta?! One of the most impressive I’ve laid eyes on. Baby Tessa fractured her humerus at birth, but she has recovered splendidly with just a little splinting. 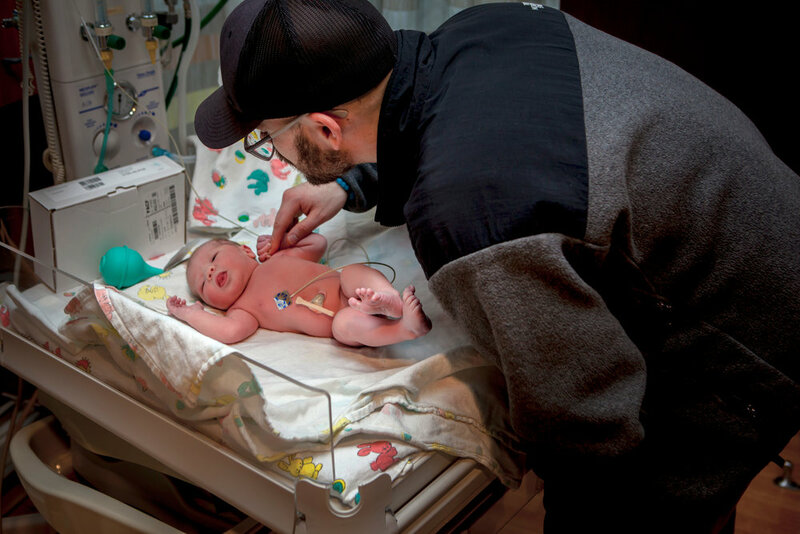 Our bodies are so incredible, and Tessa’s birth reminded me once again why I count myself lucky to be invited to document the birth stories of Seattle families. Birth is sometimes peaceful, sometimes dramatic. But always miraculous. There is so much to consider when having a baby. Where to deliver? Which care provider? Epidural or no? Doula? Birth Photographer? It can feel overwhelming, to be sure. And this is all before the baby comes and you are responsible for a new life! In my daily conversations with couples considering birth photography, there are certain themes that come up again and again. 1. Birth is a once in a lifetime event. We photograph important events—it's just what we do. It's one way we show that this moment meant something to us. Our parents posed us with prom dates, we hired photographers for our weddings, we plan to snapshot each milestone of our baby's life. What could be more important than the day of their birth? My daughter's birthing day was far more exciting and emotional than my wedding day. What I wouldn't give to have professional photographs of the first time she took a breath, the first time I kissed her face—those first moments I became a mother and my husband a father. 2. 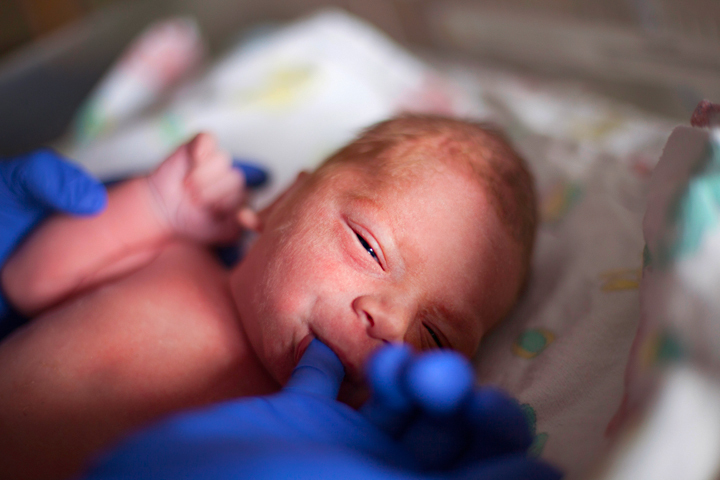 Birth photography is for you. You grew this baby inside you, you dreamed of this baby, and now you will birth this baby. There is a lot you will miss on the day you give birth. You're kind of busy having a baby! But those small details are so meaningful. I love sitting with women as they look over their birth photos. They see their own strength and fortitude in a brand new way. 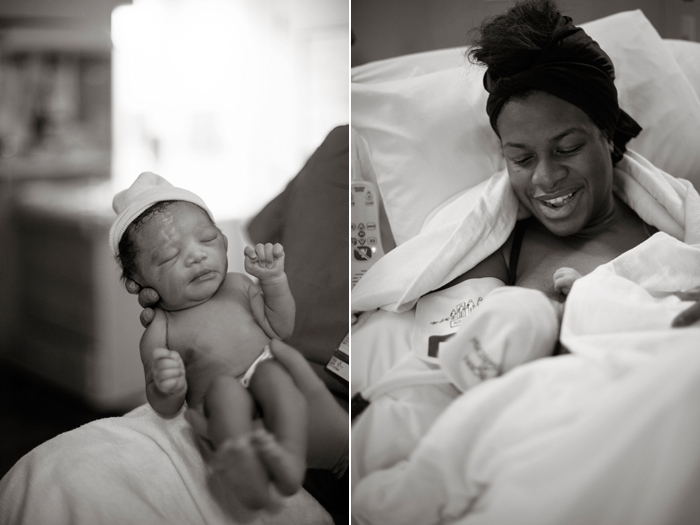 Many of my clients have found birth photos useful in helping them process their labor and delivery. 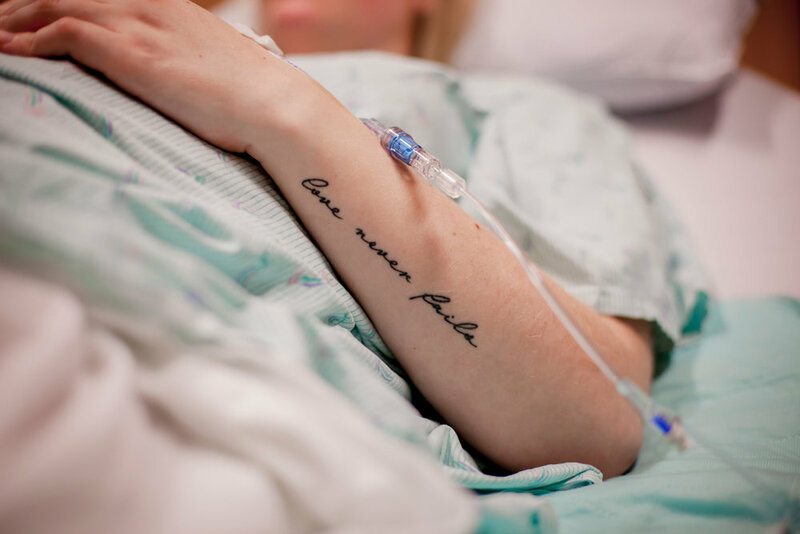 Whether it was a whirlwind birth or long and slow, dramatic things happen during the birth process—things we don't always anticipate. 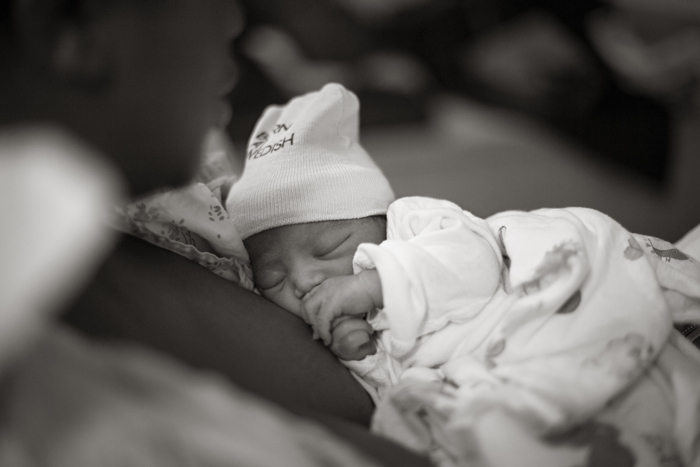 My photographs illustrate beauty and provide context—often a needed healing balm for new parents. They also give you the chance to just reflect on your own incredible power. You brought a life into the world! It's an amazing feat. 3. 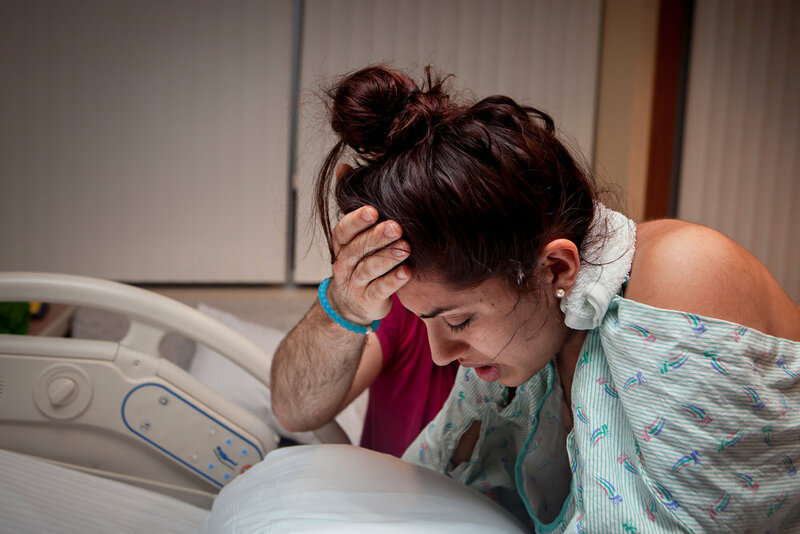 Birth photography is for your partner. My husband was my rock during three very different labors. I've never felt so loved and so held as I did in those hours as we worked together to bring our children to earth. I still remember his steady gaze as I centered myself through each contraction. It's a look I see again and again as devoted partners prepare to become parents. 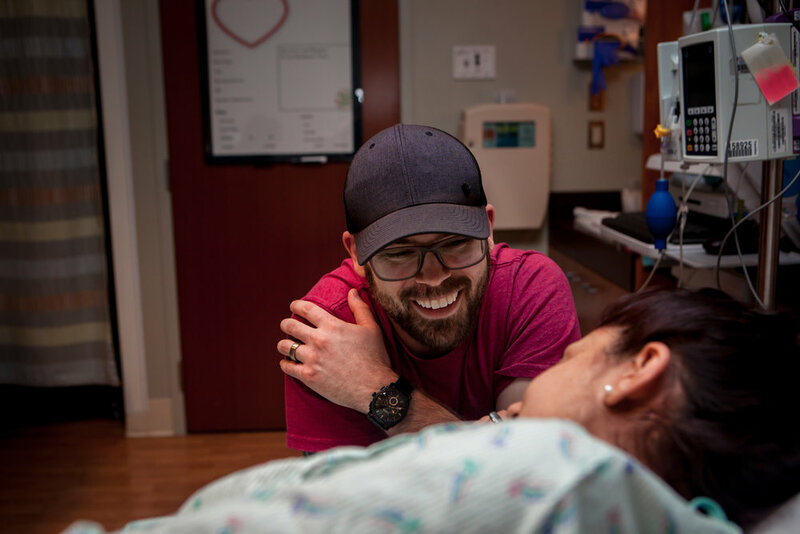 When your baby is born, it's such a gift to give your partner the opportunity to be completely present and engrossed in that moment. Let me photograph your first precious minutes as a family—so you can just live them together. 4. 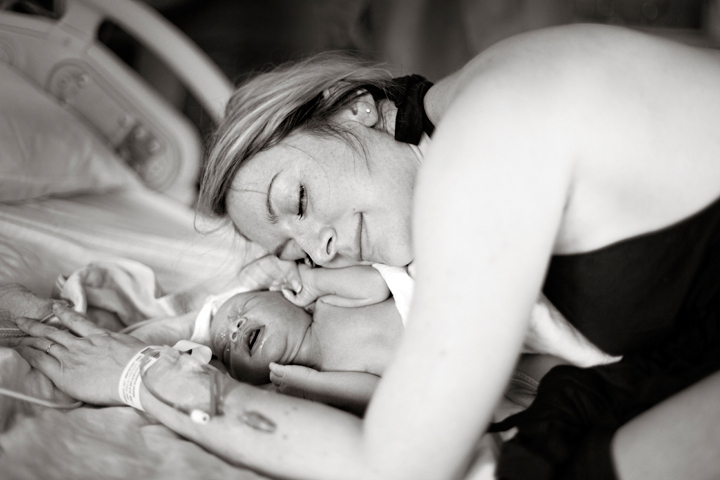 A birth photographer brings reassurance and support. 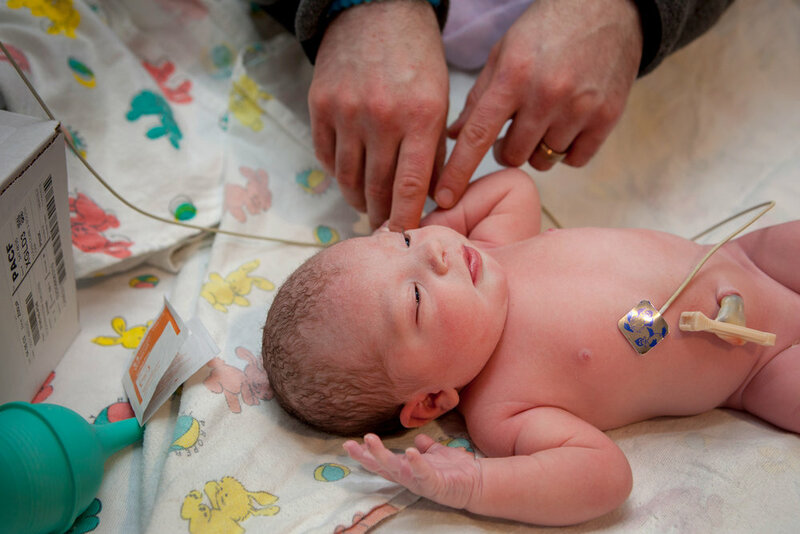 You may not know which doctor delivers your baby. 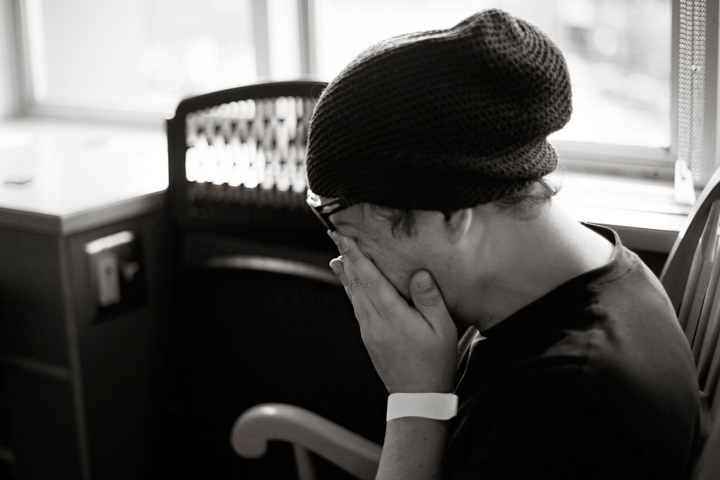 Will the provider on call be the one you really like? And chances are you've never met the labor and delivery nurse who will be with you during the bulk of your birthing experience. Bringing someone along with you, someone you know and trust, someone who has spoken with you at length about your birthing desires, your fears, your hopes—it really helps you feel supported and safe. 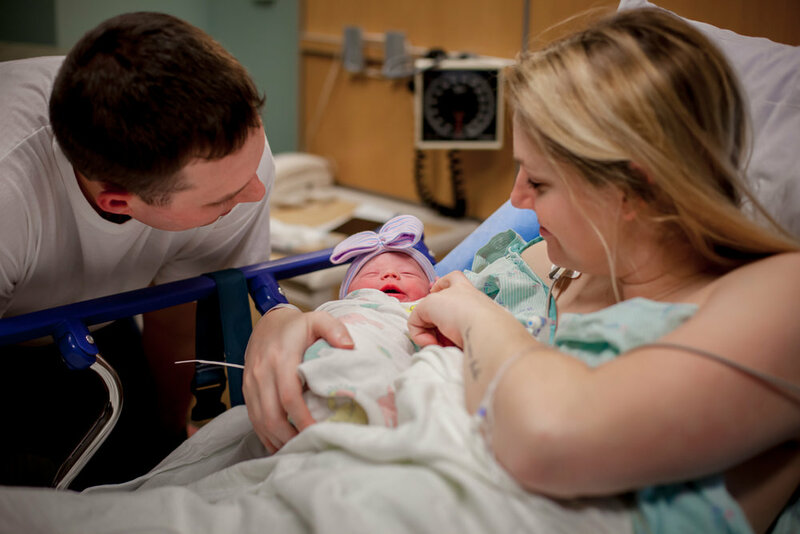 As your birth photographer I have a connection with your family and also a familiarity with the process of labor and delivery. Nothing makes my heart soar like hearing my clients say what my presence in their birthing room meant to them. 5. 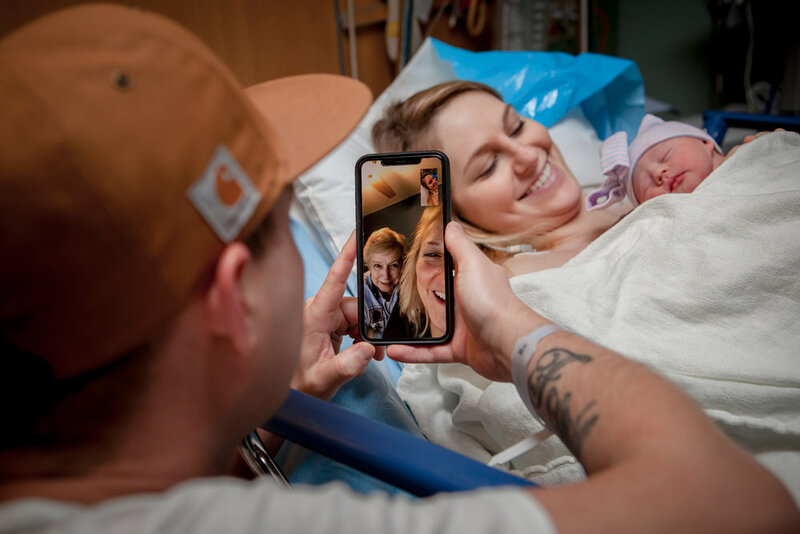 Birth photography is about telling your family's story. I love to tell stories—whether gathered in the living room with friends, tucking my kids into bed, even on stage in front of strangers. But the stories I tell with my camera—those are honest and real and incredibly meaningful. Hiring a birth photographer is about inviting a storyteller to make art from your most intimate moments. The transition into motherhood—it's a doozy. You experience the highest highs and lowest lows. 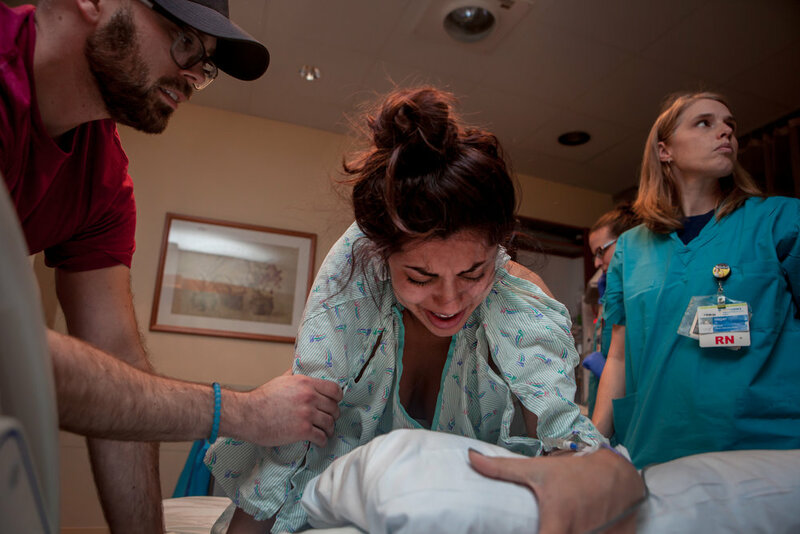 This is why I fell in love with documenting birth. There's no primping or posing or faking it. It's raw and emotional and I've never seen a more compelling story than the day a child is born. 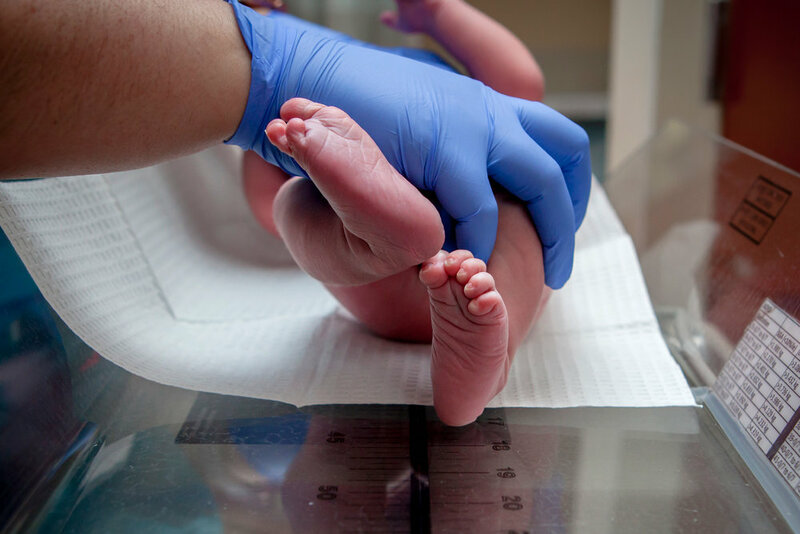 If you're looking for a Seattle birth photographer to tell the amazing story of your child's birth, reach out and let's schedule a consultation! I look forward to capturing the beauty of your story— however it unfolds. She birthed her prince right there in her own living room - in the home they will share together. 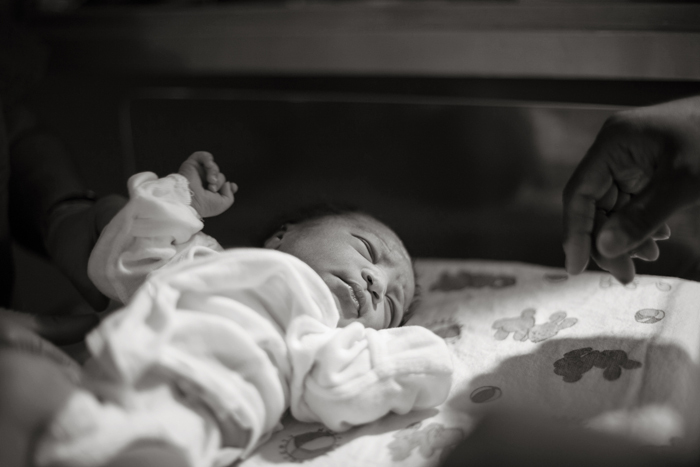 Her grandmother, her sister, her doula, a photographer and three midwives in attendance. She swayed on the waves of labor, breathed her way through. And when it came time to surrender to the utter intensity of it all she did so with the support of the many women around her. She worked and she pushed and when he arrived, she held the greatest miracle in her arms. She is his whole world. She brought him here. And with the same fortitude and courage she called upon in birth, she will guide him through this life. Together for always - mother and son. A birth story - annotated. When I walk in and a second time mama looks like this - I know things are going to happen FAST. I steady my breathing, steady my camera and start to shoot. Shannon continues to work through intense contractions and I wonder aloud, "Where's Hal?" A nurse informs me that he's in the waiting room with their 2 year old son. Everything is happening so fast that the grandparents have yet to arrive. They're on toddler duty and it's not clear they'll get here in time. The midwife lets Shannon know that her baby will be born with the next couple of pushes. Does she want someone to go get Hal? No one is here to watch Bowie yet. It wasn't in the plans to have him in the delivery room. What will we do? "I'll watch him!" I call out at the last minute. Not really sure where that came from or what I was planning to do, but I just couldn't stand the thought of Dad missing the birth of his son. Suddenly he's there and all is right. Grandparents arrived just as a nurse was coming to get him. We're having a baby - RIGHT NOW! The midwife passes her baby between her legs and lays him gently on the bed. He's finally here. The one they've been dreaming of. 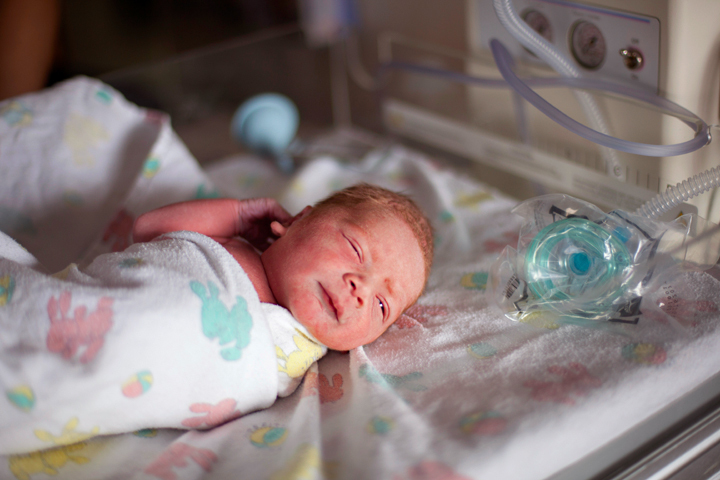 The next few images show what's known as "the birth pause." I had never seen it before as many providers place the child directly on mom's chest. But when undisturbed, many women take a moment, take some breaths and look over their baby before bringing him in close. Tears and hugs all around. There's a new soul in the world. The placenta really doesn't get enough credit. Sure, the baby is the real star. But stop to consider for a moment - in addition to growing an entire being, a birthing woman also grew an extra organ. It kind of blows my mind. I always love to capture the first time a new baby locks eyes with with camera. Welcome to the world, Little One. I will always remember this moment. We were making small talk and oohing over the baby as I photographed little details and they all got acquainted. Shannon and Hal knew that it was my daughter's birthday this morning - I had just left a pancake breakfast to meet them at the hospital. "What's her name?" Hal asked. "Wren," I said, smiling. Suddenly he burst into tears. "That's HIS name!" This perfect tiny boy, shares a name and a birthday with my own daughter. The world is at times a very small and wondrously connected place. Finally it was time to meet big brother. Those first reactions to a new baby are so priceless! The wrinkly fingers and dried blood behind the ear. Shoulder fuzz and perfect neck creases. Fresh new babies are magic. It was a truly beautiful day. Shannon shared the most beautiful thoughts about her birth experience and her experience having a photographer present. Head to her blog to hear the story from her perspective. Evangeline's mama knew she could do it. She knew that the women who came before her had done it and she knew the same power they exercised lived within her. 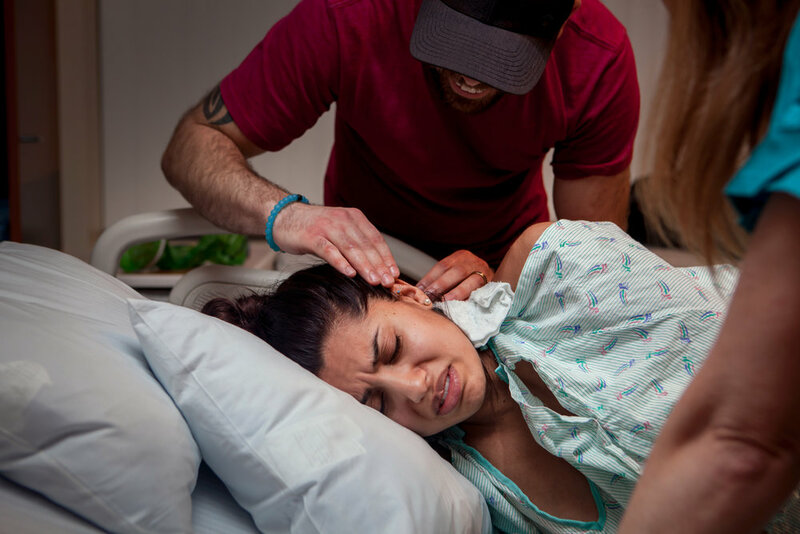 LeAnna knew how to listen to her body, and to let it guide her through the contractions. Russell also knew she could do it and continued cooking Christmas dinner while she labored in their apartment. 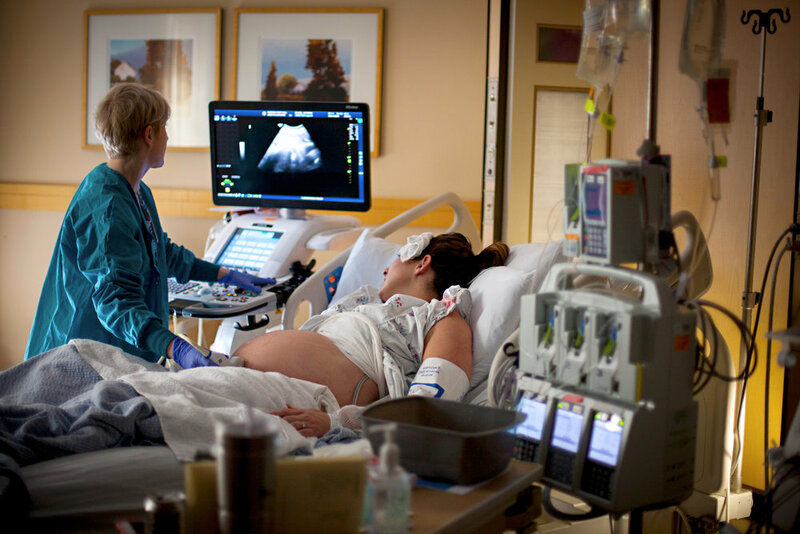 Upon arrival to the hospital LeAnna heard that she was completely effaced but not yet dilated. Still, she knew. She knew her baby was coming. It was less than two hours later that I got the call to come to the hospital. I could hear all the hustle and bustle in the background as Russell told me they were checked into their room and I just KNEW delivery was imminent. I was going to miss it. No one could have guessed that a first time mama would dilate so quickly. 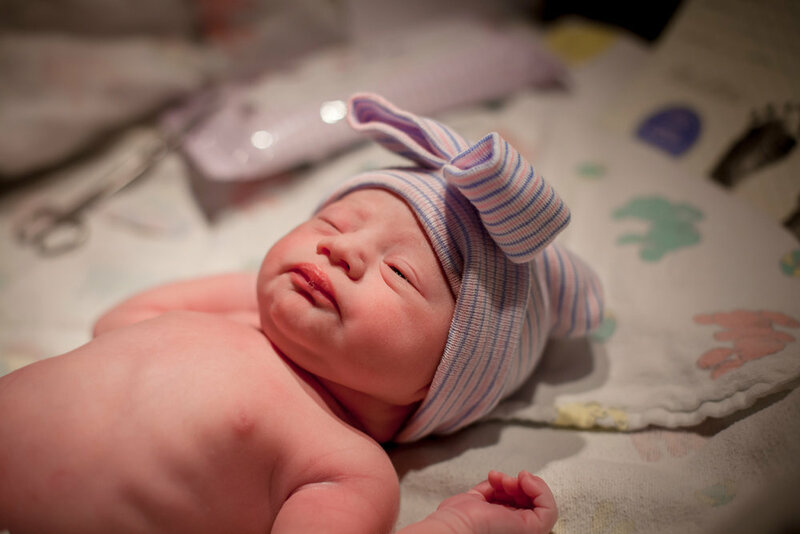 That her baby would be born 35 minutes after my phone rang, 10 minutes before I arrived in the delivery room. But LeAnna knew she could do it and Evangeline knew exactly when and how she wanted to be born. This little Christmas miracle - this speeding bullet of a baby. 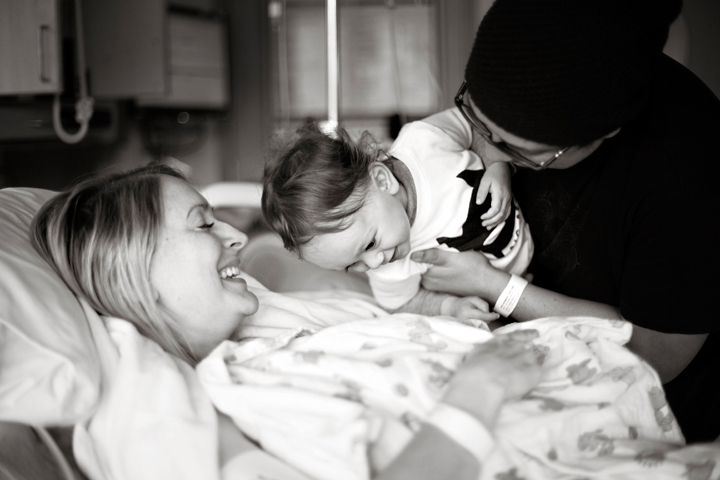 She was welcomed by her parents, a breathless doula and smiling midwife. The strength of her mama (and the mothers before) brought her earthside. We all knew she could do it. And she did.